Casino Barriere Saint Raphaël offers English Roulette, Black Jack and Stud Poker table games, 158 slot machines and live poker. 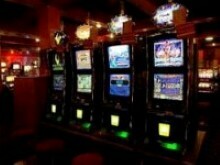 Cash games are held every evening from 9pm to 4am and 8pm to 5am on Saturdays and eve of public holidays. There are 2 bars and 2 restaurants in the casino. Admission is free, gaming currency is euro. Slots: 10am to 4am on weekdays and 10am to 5am Saturdays, eve of public holidays and during the summer. Table Games: every evening from 9pm to 4am and 8pm to 5am on Saturdays and eve of public holidays.